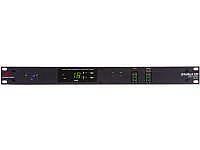 DBX 220i System Processor with AFS Advanced Feedback Suppression, Designed from the ground up to provide state-of-the-art signal processing, the DriveRack 220i is the perfect tool for any fixed-install application. With a full complement of processing features and Mic/Line inputs the DriveRack 220i can provide both system and microphone processing. Featuring the new, patent-pending Advanced Feedback Suppression (AFS) algorithm, equalization, dynamics processing, delay, matrix mixing, and bandpass filters, the DriveRack 220i will exceed your expectations.